There are two ways Huebert Builders will begin planning and developing your new commercial construction project. One way is to start completely from scratch. Our team will take your design ideas and implement them into our building process followed by the assistance of an architect. On the other hand, some clients will come to us with the blueprints already constructed by an architect. In both cases, Huebert Builders will provide you with estimated building prices and guidance through the construction and remodeling process. Pre-construction focuses on finding the right contractor for your construction needs. In this phase, lists of materials are prepared and sent to various contractors in order to request quotes. This part of the process also involves gathering necessary permits for as well as completing all of the insurance requirements for your commercial construction project. Items and services are organized and paid for during the procurement phase. Labor equipment and materials are all necessary components for the new construction of your commercial site. 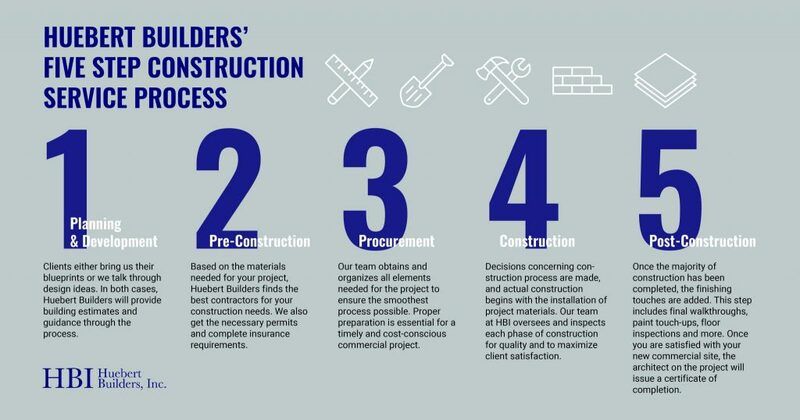 In the first phases of your commercial construction project, it is important to have everything in order before starting the construction process. 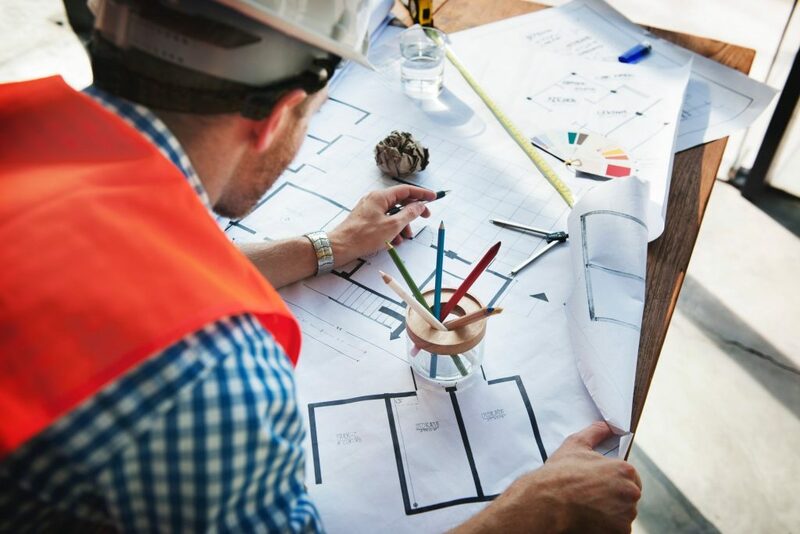 At Huebert Builders, we ensure all of these elements are organized and settled–allowing the building process to run as smoothly as possible. Huebert Builders specializes in commercial, institutional and education construction services. Depending on the type of construction site you wish to build on, you may have to meet with the superintendent or whoever manages the space. Decisions are made in regards to site access, work hours, time schedule and more. Next, the construction begins including installation of all materials to complete your project. As progress is made in the construction phase, our team at HBI supervises and inspects ongoing work to ensure quality and satisfaction. The post-construction phase consists of completing the final touches of your commercial construction project. Final walkthroughs, paint touch-ups, floor inspections and other items on your checklist are looked over and perfected. Once this is finished and you are happy with your new commercial site, the architect will issue a certificate of completion. Your new building is now official and ready for occupancy! At Huebert Builders, we guide our mid-Missouri clients through every step of the commercial construction process. We work one-on-one with you to provide important information, while you provide us with a specific plan of action. With our construction process, our clients receive the highest quality construction and remodeling services in mid-Missouri. We strive to take time and budget into consideration and communicate with you through every step of the building process! Learn more about our commercial construction company here. Get started on your new construction project today! Contact us through our website, or give us a call at (573) 449-4996 to schedule a consultation.